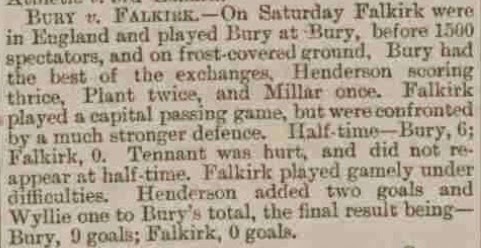 Not one of the most illustrious notes in the history of Falkirk Football Club, but still a match worthy of noting was Falkirk's 0-9 crushing at the hands of Bury at Gigg Lane in December 1896, notable because it was Falkirk FC's first match outside of Scotland. Of course the club were out of their depth, Bury were a serious force in the English League, whilst Falkirk were a middling team in the Scottish Combination [a league made partly of provincial sides and partly of City Clubs' reserve sides]. The result looks a bit embarrassing at first glance, but the gulf in the teams probably was about that size. Plus there were other things to take into account, for example there were significant differences between the laws in Scotland & England and this game would have been under laws that Falkirk had never played under before. 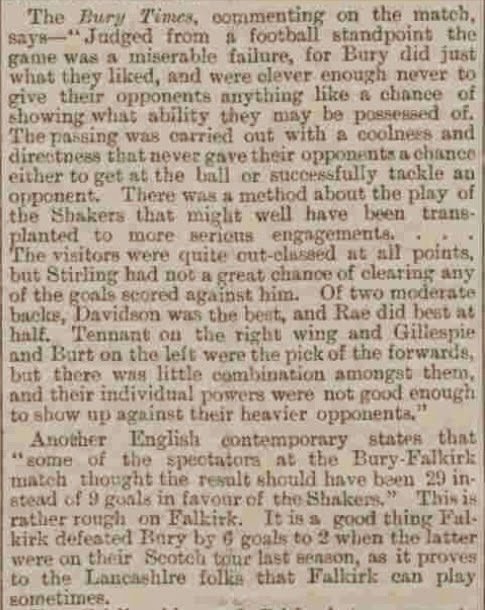 And it must be said this was a bit of a makeshift Falkirk side [for example David Robertson [the Albion Rovers RB playing because his brother was at Bury and he was visiting]]. 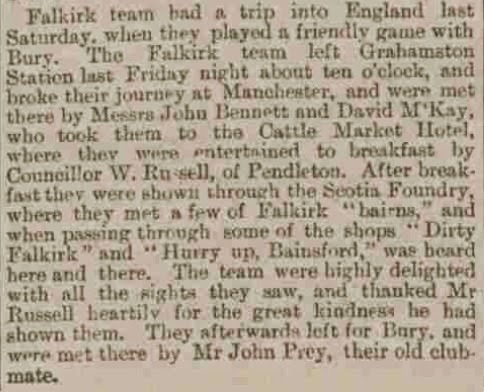 There is little doubt that John Pray had something to do with this match taking place, as the then Bury centre-half was a Falkirk lad and had risen to prominence in the centre of the Falkirk Half-Back line before going down south by the even back then circuitous route by way of Govan: there is nothing new in Scottish Football. However, the thing I like most about this is the way the team never went straight to Bury on the train, and instead stopped by way of Pendleton [birthplace of John Simpson] to visit the Scotia Foundry, where there were many a Falkirk Bairn [and quite a few Bainsford folk too], this link between Falkirk/Bainsford & Pendleton has largely been overlooked now that the steel & iron is dead in both communities, but back then was so pronounced that it was not unknown for the Falkirk Herald to carry reports of inter-foundry matches from Pendleton depending upon the amount of locals involved.